John Craxton was the first choice illustrator for many of Paddy’s books. An exceptionally talented artist, he died in 2009 aged 87 years. You can read his obituary here. In this article from the Spectator first published in 2004, Andrew Lambirth talks to John Craxton about the recreation of his designs for Ravel’s Daphnis and Chloe choreographed by Frederick Ashton. John Craxton (born 1922) is a painter who has spent much of his life in Greece. Growing up in an intensely musical family in Hampstead (his father was the first pianist to play Debussy in England, his sister was a celebrated oboist), he was aware from a very early age of the infinite and magical connections between sound and the visual image. His subsequent work as a painter has all the structure one expects of a great composer: his are paintings which sing of their substance. Craxton first went to Greece in 1946, staying on Poros, an island renowned for its ravishing charm (Lawrence Durrell called it ‘the happiest place I have ever known’). In 1951, Craxton shared digs with Patrick Leigh Fermor. Apparently, Leigh Fermor’s preferred regimen was to taverna-crawl by day and write by night. Craxton, ever the sociable, found painting by night difficult because of the lack of proper lighting. A big picture was on the go, but progress was somewhat hesitant. Then came a telegram from England. Craxton already knew Frederick Ashton slightly, so the suggestion that he design a ballet for him was not completely unlikely, though it was unexpected. Suddenly the artist had to decide: stay in Greece and work on his picture, or up sticks and go back to London. The seductive Mediterranean or the ration books of old England? Uncertain what to do, Craxton went to see an old friend who happened to be ill in bed at the time, fiddled with his radio and tuned in to — Ravel. It was Daphnis and Chloe, the very music of Ashton’s ballet. A sign like that (no doubt from the gods themselves) cannot be ignored. 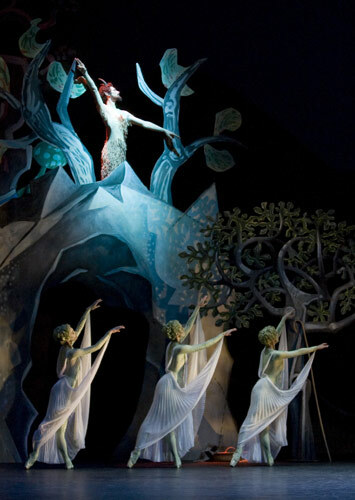 Craxton returned to London, and in a very few months designed the decor for Ashton’s ballet. Craxton made only one stipulation, that the costumes be modern dress, not ancient Greek, an idea that Ashton was open to. That was in 1951. The principal dancers were Margot Fonteyn and Michael Somes. Daphnis and Chloe was a notable success, and it has remained in the Covent Garden repertoire ever since, revived from time to time with new input from Craxton. Now it is being staged again. The main problem for the designer was that nearly all his designs, sets and costumes had been done away with, in one of those senseless purges which from time to time disfigure great institutions. Only two costumes survived this petty holocaust — the ones which Margot Fonteyn had herself given to the Opera House’s archive. Nor were there drawings from which the originals might be recreated, for many of them had come about through the combined efforts of Craxton, Ashton and Fonteyn. Time was short, and the three not only shared a common artistic aim, but also understood how the project might be realised. Costumes could even be improvised from a bolt of cloth, if necessary. For that original production, Craxton painted all the scenery by hand himself. To recreate it in 2004, he had to rely on his memory, a few photographs and the album cover of a Decca long-playing record of the ballet. Rather amazingly, Craxton has triumphantly summoned forth once more his enchanted island setting, with cave-mouth, vine pergola, barren rocks and fig and olive trees. I visited him at the Royal Opera House production workshops in Bow Industrial Park in east London. There he was putting the finishing touches to some olive trees, which he was painting on their sides. This was Craxton’s first ballet, but the painting of scenery was relatively straightforward for an easel painter. He was, however, a novice costume designer, having no idea how to make a dress, and to begin with he was forced to rely on the wardrobe department. Requesting an absolutely classical lady’s dress, he was presented with a 1938 short cocktail dress, as he describes it, ‘off the shoulder, pleated — dreadful. I went to see what had been done with Margot and Freddie and I was practically in tears. I didn’t know what to do or what to say. Margot was brilliantly clever and sensed the terrible state I was in with worry and disappointment and said, “I don’t think this is really what John wants at all.” So she got the material together and started to bunch it up and designed a costume with a tight bodice and loose skirt. Only Margot could have done that. We found a material called stockingette, which hung very well and dyed very well. Now the rocks in scene two have been redesigned and painted porphyry red to make them more menacing, and there’s a new drop curtain. The pirates are all dressed in black as Cretans. 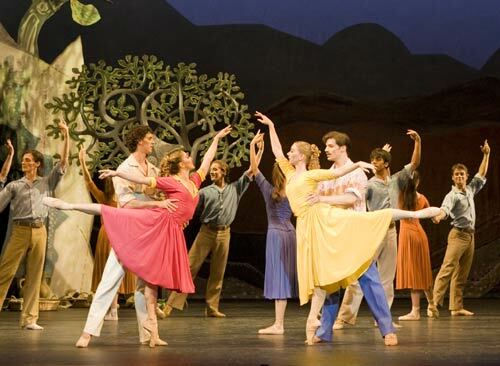 The ballet really looks like one of Craxton’s own paintings come to life — ‘It was the only honest way I could do it. I couldn’t have done a pastiche of ancient Greece — it’s not me. It was one of the first Mediterranean ballets, based on my own experiences in Poros and Crete.’ For this reason, Craxton’s sets have an authenticity which is as compelling as it is beguiling. This entry was posted in Paddy's Friends and tagged ballet, Frederick Ashton, John Craxton on October 11, 2011 by proverbs6to10.